DKIM (Domain Key Identified Mail) is used to detect email spoofing. The recipient validates the signature against the public key registered on the DNS for the sender. To enable DKIM on Office 365, access your portal and go to the exchange admin center. 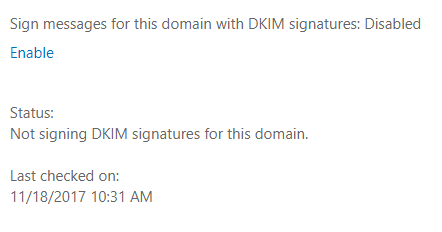 Once they are replicated, enable the DKIM again. From here you can rotate your keys too if needed.